But we're clearly supposed to think that makes sense. It's worth mentioning that Bridget has a friend, Rowl. Rowl is a cat, and the heir of Clan Silent Paws. He doesn't understand everything about humans, but he really is a lot smarter than most of them. Bridget is also starting her year of service in the Spire Guard, and Clan Silent Paws has decided to send Rowl along to protect the offspring of their favorite ally, Wordkeeper, a.k.a. Bridget's father. I will freely admit that in the normal course of events, I wouldn't have picked up this book. I'm not a fan of Jim Butcher, and there was nothing to suggest I'd like this better than last year's Hugo nominee from the Dresden Files series. I don't really care about these characters. I could get interested in a story where Gwendolyn was the main protagonist, with the others in supporting roles. Or I could get interested in Bridget and Rowl as the central characters. And I can easily see how other people might be similarly interested in a story with Grimm as the main protagonist. I can't care about him, but that's me. I'd expect him to appeal to a fair number of readers, especially if they are already fans of Butcher's work. For me, though, I feel that as a reader I'm being jerked around a bit too much from one character and viewpoint to another. And while I think Rowl is really excellent, for me, it's not enough. I didn't care for this book. I suspect plenty of other people will, and Mr. Butcher has nothing to worry about. He's a very competent writer, just not writing what appeals to me, and not doing it well enough to win me over anyway. 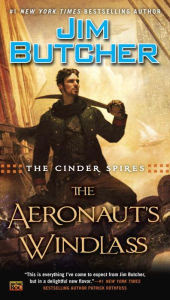 I wouldn't be reading it at all if it weren't on the Hugo ballot for Best Novel, but if you like airships, grim, or Grimm, officers, smart young ladies being pushed out of their comfort zones, and well-done intelligent cats, maybe read the sample on Amazon and see if it works better for you than for me. The cat is really well-done.